Before I jump in you should know my background is in advertising and PR with a heavy emphasis on, you guessed it, branding. In addition I have over a decade of experience in general marketing and media sales. Last year I joined the board fora local non-profit. One of the things that interested our President in my appointment was my background in marketing. This week I was able to host a marketing planning session with our marketing committee and it was music to my ears. There was talk of storytelling and brand architecture – the importance of consistency and messaging strategy. All the things that can easily get overlooked and create brand confusion. It was thought leadership and big picture thinking. Ahh…it felt good. Being in the planning meeting today reminded me that brand strategy and planning isn’t just for corporations or non-profits. It’s equally important for small businesses, entrepreneurs and even us bloggers. Now I might be new to blogging but I’m not new to branding and marketing. Clearly determine what you want to be known for and think of three to five descriptors to describe you and/or your service. What service or solution will you provide for your audience and/or customers and how are you adding value for them? Find competitors in your space and ask yourself – what do they look like, colors and imagery? What is the tone of their messaging? What are they solving or providing for their customers or audience? How are you different from your competitors? Think about what colors, imagery, and tone of voice exemplify you and those descriptors that you came up with. Start to pencil out your brand architecture. What do you stand for? What does your brand voice sound like? What are you solving or providing for your audience? What are some of your main messaging points? Then evaluate. Are the things you want to be known for aligning with what you are solving for your audiences and/or customers? If so, move forward. If not, go back and identify what is off. Starting with these six steps will help you build a consistent brand that consumer and audiences can trust. It’s a little more work than just winging it but it will provide a more thoughtful and put together end result. What challenges are you having with organizing your brand, personal or business? I’m here to help. Let’s chat. Leave a comment below. Be on the lookout for part two of building your brand – building your brand tool kit. Defining who you are as a brand is the first step in making money. You have to know what you are all about and map out a clear plan. This is great. I’m a rather new blogger and this information is very helpful. I have been at it about 2 months now and I am really enjoying learning all the inns and outs. Your post is fantastic and I am definitely bookmarking it! I remember when I started blogging many years ago, I did not think about my brand that much. Big mistake…actually 4 blog mistakes before I finally settled into a blog that I have been authoring since 2013. The big think here was finally being able to identify my brand that truly reflects my blog. Thanks Cara. Glad you found it helpful. Reach out if you ever have any questions. These are really great tips on branding. My challenges come from time management – not having enough time to do everything I want to grow my brand. These are 6 incredible steps! As a blogger, I felt pretty inspired to make changes in my own professional aspects! Thank you Jessica. Best of luck on brand building. I’m sure you’ll do great. There are so many great tips here for branding! I was a graduated with a PR degree and we studied branding very heavily. Thank you Silvia. We are like spirits. I graduated with a Comm degree. Branding is one of the most important factors when you’re building a business, both online and offline. I think these are great steps for determining what kind of brand you want to be known for. Branding is definitely important online. It’s essential to define who you are/what you offer so your clients or customer will know that too! THanks so much! I have been working on my brand a lot lately and these tips really help! Glad to hear it and happy to help! 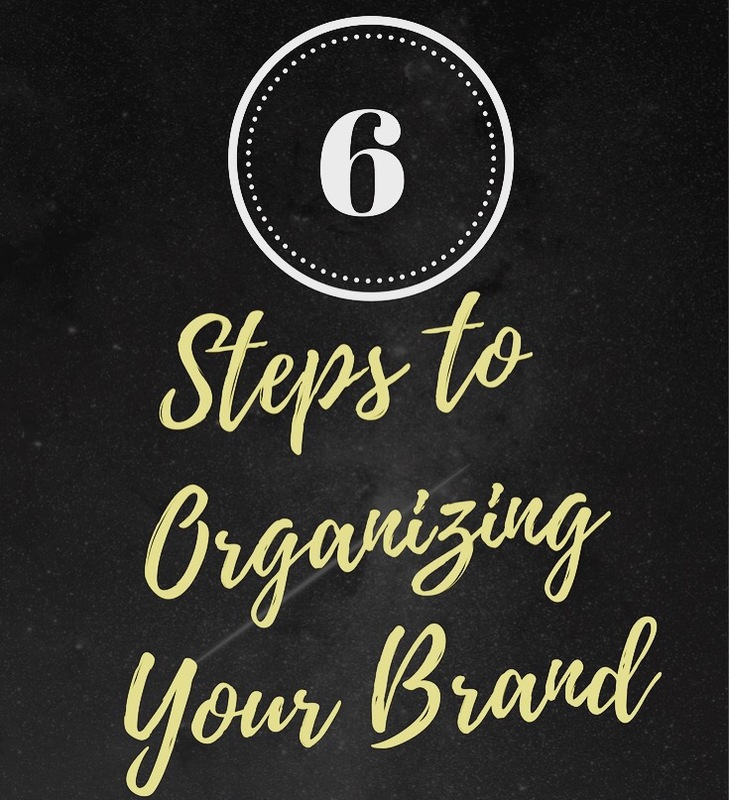 These 6 steps you share are all important when fleshing out the details of your brand/blog/business. Inspiring! Completely agree! Branding is so important in the blog world. I go to so many blogs that say they are something, and then their work is something totally different. It’s a huge turn off. I just started my blog, kitchencents.com , a few months ago and am already in the process of redesign. This post was great. Thanks for sharing. Thank you Rachel. P.S. I love your content. I really need to have some sort of a planning/retreat weekend where I can concentrate on this stuff. I work a lot in the fringe hours, which is great, but with three little ones and homeschooling, there is not a whole lot of dedicated time for me to work on brand. You are one busy momma. Thanks for visiting. Branding is a big deal. I can attest to that as when I began my business 19 years ago, I (thankfully) put a lot of time and attention into branding, and it REALLY paid off. The brand is still going strong today!! Branding is so important and can be really difficult. The 6 steps you shared are so helpful! These are very helpful tips. Learning the ropes of blogging can be very hard and branding is one of the most important things to start with. These are great tips! Branding can get so confusing! This is a great roadmap to get started! Branding is so important to any company or publisher. It’s something that everyone should pay attention ti. This was hard for me to do with my blog because when I first started it, it was just a hobby, writing about whatever, whenever. So basically I needed to go back and really figure out what I wanted my blog to focus on! These are great tips, especially for someone starting new! Thanks for the info! As a fashion photographer, I often incorporate branding into my shoots. It is essential that I have this skill set and that I am able to ensure the photographs translate into a cohesive them for my clients. Good Advice and so on pointe! Having a clearly defined brand image and structure is so important. I was lucky that I had a mentor who shared with me the importance of branding when I started my blog. Thanks. It’s great to connect with like minded folks.